Thinking about buying a baby jumper activity center for your little one? Wait up and first figure out whether he has reached the safe age limit to use a jumperoo. No doubt that baby jumpers are crazily popular among babies. And why not? The first ever adrenaline rush of bouncing on the floor will be priceless for anybody. Many pediatric physiotherapists have gone on record stating the importance of a jumper in a baby’s development. It fosters the development of calf muscles and motor coordination. Add to that, it keeps your baby active, giggling and entertained which alone make buying a jumper totally worth the money. However, in order to get the best from a jumperoo, ensure that your baby has reached the right age for using the toy. So, as a mother who also happens to be a pediatrician, here are a few things I want you to know before you buy a jumper for your baby. How to Know If It’s Jumper Time? So when parents ask me when baby can use jumper, I give them two answers. One short and another more elaborate. Short answer: Whenever your baby seems ready to bounce around and have a blast. Your LO can support their heads on their own. This is true but only to a certain extent. These days, most manufacturers specify the user age and height for their products. So even if your kid has good head control, you should wait a little more before letting him bounce in a jumperoo. The second green flag you should look for is whether your baby can support is torso properly. Third is the age. Depending on the product you are buying, it could be 3 months or 5 months. Always, I repeat, always refer to the age limit put forth by the manufacturer before using a jumper. Last but not least, you need to consider the height of the baby. He needs to comfortably fit on the seat. Find a size that allows the kid’s feet hit the floor. If it dangles above the floor, it can lead to toe stepping and promote bad posture. You definitely don’t want that. After considering all the above factors and a long chat with my fellow pediatrician colleagues, I can say that the best age for your baby to start using a jumper is 4 months. While some babies can hold their head steady unassisted from 3 months, I would still suggest you wait for one more month. I did some digging on the web and found out that many renowned jumper manufacturers agree with me. However, some other brands suggest that the ideal baby jumper seat age is 5-6 months. So, the brand you are opting for also plays a role in determining the right age. Babies can bounce on jumpers right up to their walking age. Why the time between 4-6 months. Because during this period, not only they gain good head control but they also start to (or about to) start crawling. This means they can support their trunk fairly well. Height is just as important as the above factors. As I said before, if their feet are constantly dangling above the floor, it can lead to bad posture as well as tiptoe walking. Well, apart from finding the right seat size, you can also do one more thing to avoid such issues. Simply put a pillow under his feet if they are hanging. Also, adjust the seat height to the lowest if your baby is not tall enough for the jumper. 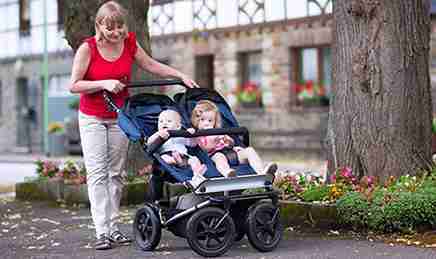 Finding out when can baby use jumperoo is not the end of the road. There a few other safety aspects to consider as well. Baby jumpers are generally quite safe if you find the right model and use it properly. Small but strong babies easily get carried away. Therefore, sometimes they can start bouncing vigorously on the jumper. This is bad for a lot of reasons. One, extended use of a jumper like this can delay walking. Two, it causes over-development of calf muscles. Three, it may cause the much-dreaded tip-toe walking problem. I am not saying this to deter you from buying a jumper. I am just asking you to be cautious. Moderation is really the key, here. As long as you limit the bouncing time to 15-20 minutes max per day, you have nothing to worry about. Also, please carefully check the design of the jumper before buying. There are mainly three types of jumpers in terms of design- door jumpers, stationary jumpers, and stationary activity jumpers. Among these three, doorway jumpers seem to be more popular among parents. And why not? Children can have a blast on such jumpers. But I, personally, am not a big fan of this particular type though. It’s very easy for your baby to hit the sides of the doorway and hurt himself badly. If you ask me, I would rather recommend getting a stationary activity jumper for it has an enclosed seat suspended on an enclosed spring. Therefore, fewer chances of getting hurt or falling down. 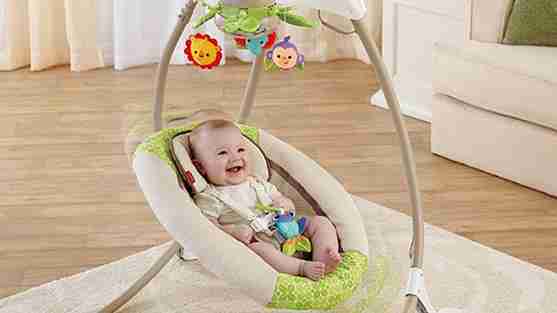 Plus, it has toys and stuff keep your baby entertained when he gets tired of jumping. The seat should allow for easy height adjustments. It should be easily removable for washing. It should be well-padded to ensure maximum comfort. Q: What is the best Baby Einstein Jumper Age? Ans: Minimum 4 months, up to 12 months. Hope this helps. Q: What is a Baby Einstein Jumper weight limit? Ans: The maximum weight should not exceed 25 pounds. Q: What is the ideal baby door jumper age? Ans: I would say 4-6 months. Q: How long should I keep my baby on a jumper? Ans: 15-20 minutes should be fine. Q: Are doorway jumpers better or stationary jumpers? Ans: I find stationary jumpers safer than door jumpers, mainly because of the later’s mechanism. Doorway jumpers can get your kids hurt easily if you don’t constantly keep an eye on them. There might be people telling you that jumpers are not safe, they cause this and that, this is the right age and this is not. Unless they have some scientific proof to back their statements, don’t listen, go ahead and buy a great jumper for your baby. By now, you must have already known when can baby use jumper, what are the safety aspects to consider and all the other nitty-gritty. Just remember to keep a keen eye on your little one when he is on the jumper, don’t let him use it for hours. Be safe and let you munchkin have a time of his life bouncing and giggling. Toodles!